Happy 149th Birthday to the founder of Girl Scouts, Juliette Gordon Low! Juliette was born on October 31st 1860 (yes Halloweeen… kinda spooky, huh??) in Savannah, Georgia. After traveling the world and spending some time with Robert Baden-Powel, the founder of Boy Scouts (don’t boo too much), Juliette decided she wanted to start her own group of scouts for girls in the U.S.
She founded Girl Scouts on March 12th, 1912, with 18 local girls from Savannah. We’ve sure grown a lot in 97 years!! 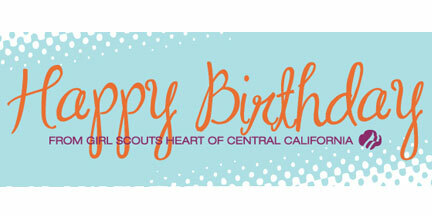 So Happy Birthday to Juliette, and Happy Birthday to all of the other Girl Scouts born in October! And don’t forget to join the Birthday Club!! Click here to join! Previous Post Win Mitchel’s autographed box of cookies! !